We use PayPal to process our payments. You can use your PayPal account or pay with credit card as a guest. Our Plano holstars will ship within 2 to 3 business days of your order date. Luckenbach holstars are custom made-to-order and will ship within 3 to 5 business days from the order date. Muleshoe holstars will take a bit longer due to the complexity involved and we will discuss this with you to ensure they arrive in a timely manner. An email confirmation will be sent when we have shipped your order. Depending on current order volume we may be able to accommodate rush order requests. We ship via USPS Priority Mail. U.S. orders arrive within 2-3 business days from the ship date. Yes, we will ship internationally! See shipping rates below. Domestic shipping (within the U.S.) is a flat rate of $5. Shipping to Canada is $9, Australia is $10, Europe is $10. Make sure you use the drop down menu to select your country for shipping during checkout, otherwise we will have to contact you which may delay the shipping date. Feel free to email us if your country is not listed so that we can get you a shipping quote! Do your holstars work with cans and bottles? Yes, our holstars can accommodate standard 12 oz. beer cans and bottles. They even work for soda cans and most bottled water! You can even add a Koozi to make sure your beverage stays nice and cold in your holstar. Orders to California are subject to sales tax. The rest of you get a bit of a break for now! Plano holstars – If for some reason you aren’t completely satisfied with your purchase, we will offer you an exchange or full refund. Refunds and exchanges must be received within 20 days of the ship date. All items must be returned in their original condition. Unfortunately, shipping fees are non refundable. Items sent back for return or exchange must be clearly marked on the outside of the package. Luckenbach and Muleshoe holstars – These holstars are custom made-to-order. We will exchange or refund any Luckenbach or Muleshoe if there is a defect or mistake in completing your order (e.g., if you ordered a Medium Brown holstar and receive a Black holstar). If you need to return a Luckenbach or Muleshoe, please contact us immediately! Our skilled artists and leather-crafters work very hard to make the best looking product on the planet. There are natural variations in leather so every holstar may be slightly different. Because of the intricacies involved in leathercraft, please understand that some artwork will be left up to our artists’ interpretation. We understand that you want your holstar to be perfect so we strive to make every holstar exactly the way you want. We are proud to boast that we have 99% satisfaction rate. Please take a look at our gallery to see how amazing your holstar could look! Of course we do bulk orders! Please contact us and we’ll treat you right! We make every order custom just for you! We show a lot of pictures of our holstars on our site, but just because an item looks a certain color online doesn’t mean it will be exactly that color when we make yours. Since we make each holstar by hand, the dye color will vary, making your holstar one of a kind! What’s up with the crazy names of your holstars? We’re from Texas and we’re proud of that. We all know everything is bigger in Texas, including the number of cities we have. With this large pool of city names, we decided when we founded the company that we’d name each of our holstars after a city in Texas. Seriously, look up the our holstar names and you can learn more about about the great state of Texas too! Your holstars don’t come with a thigh strap. Why not, doesn’t it make it more secure? There’s a few reasons we don’t include the thigh strap with our holstar. First, we don’t actually believe that the thigh strap makes the holstar more secure. When carrying a beverage in your holstar you want the beverage to stay as level as possible. Then, when you think about your walking motion, if your holstar was strapped to your leg, it would be constantly swinging back and forth with your leg. However, with no thigh strap, it will say more level, just hanging there while you walk. Second, with no thigh strap you can sit down while still wearing your holstar and it will hang down and remain usable. If you have it strapped to your thigh you’re going to spill your drink everywhere! Finally, we honestly just don’t like the way it looks, especially if you’re wearing jeans or pants. When you have a thigh strap tied around your leg, it creates this odd look where your jeans are baggy until the tie and then baggy again below. Need a unique gift for your Groomsmen Party? The perfect, customizable Groomsmen gift – one of our most popular requests! Order enough and we’ll throw in the Groom’s holstar for free! Send us a message and we’ll fill you in on the details! 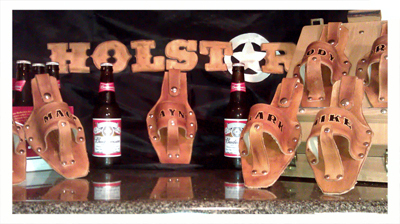 Check out the ones we made for this Groomsmen party, they’re Luckenbach Holstars.